The Board of Directors is responsible for Cramo Group’s governance and appropriate management, and for ensuring that the business complies with relevant rules and regulations, Cramo’s articles of Association, and the instructions given by the General Meeting of the Shareholders. Cramo’s Board of Directors has defined its roles and responsibilities in the Working Order of the Board and in the Group’s Operating Principles. The latter acts also as the Corporate Governance Manual for operative management. If necessary, the Working Order of the Board is revised and modified annually in conjunction with the Board’s convening meeting. The Board of Directors consists of 5-8 members, who are elected at the Annual General Meeting for a one-year term of office, which expires at the end of the first Annual General Meeting following their election. The majority of directors shall be independent of the Company, and at least two of the directors representing this majority shall be independent of significant shareholders of the Company. The composition of Cramo’s Board must facilitate the discharge of its duties in an efficient manner as well as take into account the needs of Company operations and the development stage of the Company. The Shareholders’ Nomination Committee’s proposal for Board composition as well as biographical details of the candidates shall be included in the notice of the General Meeting. There is no specific order for the appointment of the directors in the Articles of Association. More than half the members of the Board must be present to constitute a quorum. The President and CEO, his/her deputy and the CFO are entitled to attend Board meetings. Other Group management members may attend the Board meetings when required to provide information to the Board or upon invitation by the Board. The Board has unlimited access to Company information and receives continuous reporting on the Group’s operations. New Board members are introduced to the operations of the Company. This is done by arranging meetings with key people and by initiating visits to operating units in order for them to become accustomed to Cramo’s internal guidance and working methods. Cramo’s departing Board members also assist newly elected members in familiarising themselves with the Company and the Board’s duties. The Chairman of the Board, together with the President and CEO, prepares the items to be discussed and decided at Board meetings. 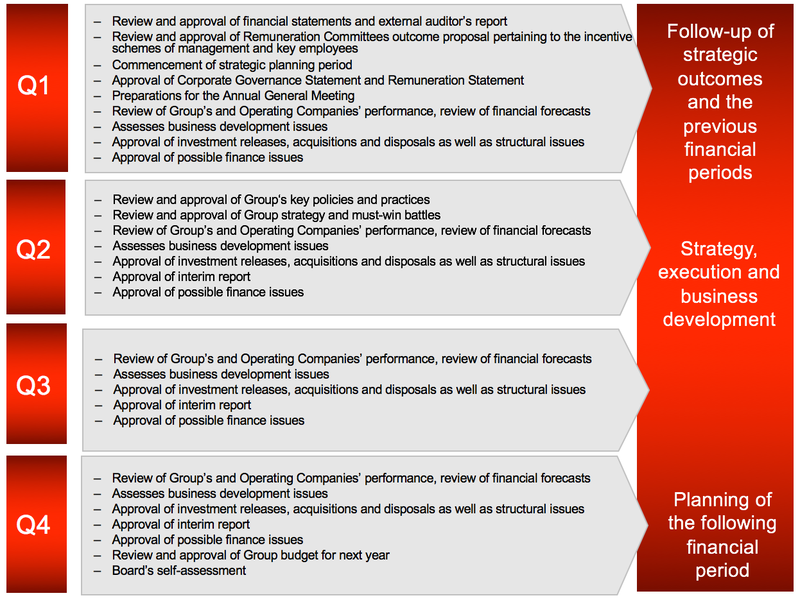 The agenda for the Board meetings, with all relevant information about the Company’s structure, operations and markets, financial performance and financing issues, personnel and investment resources as well as the risks associated with any of these matters, is distributed at least five days prior to the meetings. The Chairman of the Board also initiates and leads the self-assessment discussion during the relevant Board meeting. The Board of Directors conducts an annual self-assessment in order to develop the work of the Board. The overall self-assessment is carried out by discussing the matter in conjunction with one of the regular Board meetings. Each director and the Board evaluate the independence of the directors on a yearly basis and whenever required. Cramo’s Board of Directors and its Committees are composed taken into account diversity matters, such as gender and experience. Cramo pursues adequate diversity in order to promote open discussion and independent decision-making. Furthermore, adequate diversity promotes good corporate governance. The Shareholders’ Nomination Committee takes into account diversity matters when preparing its proposal for Board members. The following figure describes the Board’s operating calendar. Until the Annual General Meeting, held on 28 March 2019, the Board of Directors was chaired by Mr Veli-Matti Reinikkala with Mr Perttu Louhiluoto (Deputy Chairman), Mr Peter Nilsson, Mr Joakim Rubin, Mr Raimo Seppänen, Ms Caroline Sundewall and AnnaCarin Grandin as board members. At the 2019 Annual General Meeting, the number of members of the Board of Directors was confirmed as seven, and the following people were re-elected to the Board of Directors: Mr Veli-Matti Reinikkala, Mr Peter Nilsson, Mr Joakim Rubin, Mr Raimo Seppänen and Ms AnnaCarin Grandin. Anrew P. Studdert and Christian Bubenheim were elected as new Board members. The Board’s convening meeting elected Mr Reinikkala as Chairman of the Board and Mr Nilsson as Deputy Chairman of the Board. Mr Reinikkala, Mr Louhiluoto and Mr Nilsson are deemed independent of the Company and its major shareholders. Mr Rubin and Mr Seppänen are deemed independent of the Company, but not independent of its major shareholders. One of the seven Board members is female and six members are male. Information on the members of the Board of Directors and their business interests can be found here. Until the Annual General Meeting, held in 28 March 2018, the Board of Directors consisted of seven members, including the Chairman. The composition of the Board was: Mr Veli-Matti Reinikkala (Chairman), Mr Erkki Stenberg (Deputy Chairman), Mr Perttu Louhiluoto, Mr Peter Nilsson, Mr Joakim Rubin, Mr Raimo Seppänen and Ms Caroline Sundewall. The Annual General Meeting in 2018 confirmed the number of the Board members to seven, reelecting six members of the Board and appointing one new member. The composition of the Board from 28 March 2018 onwards has been: Mr Veli-Matti Reinikkala (Chairman), Mr Perttu Louhiluoto (Deputy Chairman), Mr Peter Nilsson, Mr Joakim Rubin, Mr Raimo Seppänen and Ms Caroline Sundewall. Ms AnnaCarin Grandin was elected as a new member to the Board of Directors. In 2018, the Board convened 12 times. Cramo continued shaping of the group’s structure. The Board established an M&A committee, which supports the management on potential M&A activities and development and implementation of the strategy work of the company. In line with the strategy, Cramo acquired KBS Infra, a leading German construction site logistics company to strengthen its position in Central European market. Cramo also acquired Nordic Modular Group to strengthen its position in Nordic modular space market. The Board concluded the assessment of strategic alternatives for the modular space business (Cramo Adapteo) and decided to pursue towards separation of the Company’s Modular Space business through a partial demerger. Further information on the work and the meetings of the Board of Directors during 2018 is provided in the Corporate Governance Statement 2018. Information on Board’s compensation in 2017 can be found in the Remuneration Statement. Deciding the Group’s structure, acquisitions and disposals as well as Company finances and investments.